This walk: 2012-6-14. Trenchford Reservoir, Tottiford Reservoir, Kennick Reservoir, footbridges, piers, double-ended shelter, grey willow, gate hanger stones, foxgloves, black slug, common coots, mallard ducks, commemorative plaque. 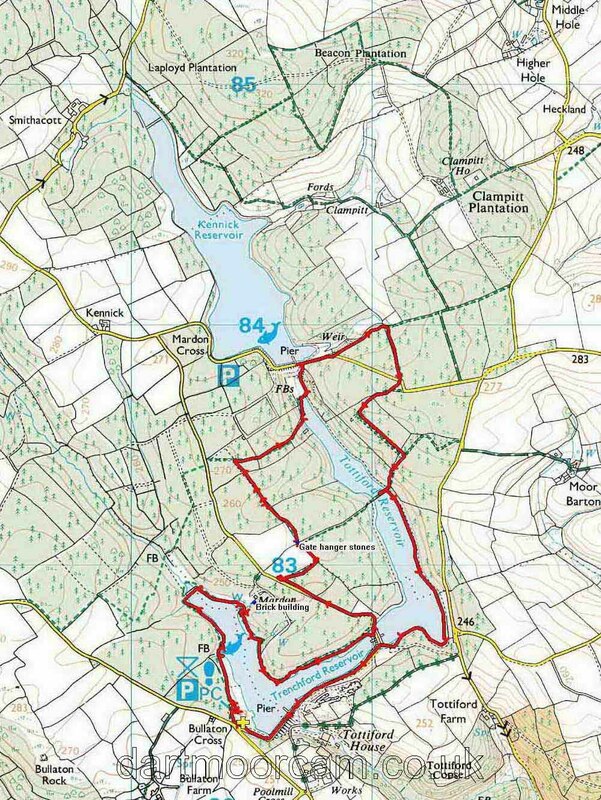 A walk involving three of the eight Dartmoor reservoirs - as explained below, Fernworthy Reservoir is also involved in these reservoirs. As previous photo ..... it says that Trenchford Reservoir operates in conjunction with Tottiford and Fernworthy reservoirs; also that Fernworthy provides the water via the Trenchford stream. After treatment, the water goes to Torbay and surrounding areas. Looking down Trenchford from the middle of the footbridge. Zoomed view from previous photograph. Another view to record the rhododendrons. Looks like a Bibionid fly, most likely Bibio pomonae, the Heather Fly. As previous view - it kept moving! We thought some areas at the edge of the water looked like mangrove swamp! An overview of the shed. Close-up of a female catkin, developing into seeds . Footbridge at the north-west end of Trenchford Reservoir. What seemed to be an old wall covered with trees. Gate somewhere along the way - I think it was off to one side of the bridge, because we then left the water for the next part of the walk along the road and then through woods. Gate hanger stone - on the other side of the gateway, this one is a short stone and may have been the basal stone in the gate-hanging arrangement. A wide path with strand lines after heavy rain. Zoomed view - it needed a tripod for sharpness because it was a little dark in the wood. The rootball of a fallen tree. On the way down, it snapped another fir tree like a matchstick - it can be seen sticking up from behind the centre of the rootball. To snap off a living fir tree of this size takes a lot of force. SX 8070 8360, sign to the three reservoirs, Trenchford, Tottiford & Kennick, with Tottiford in the background. Tottiford Reservoir: the oldest reservoir on Dartmoor, completed 1861. Within eight years, the embankment dam had to heightened. It now holds 100 million gallons of water and covers 31 acres. Source: J. Hayward (1991, reprinted 2009), Dartmoor 365, Curlew Publications, page 137. Water running down the slope into Tottiford Reservoir from Kennick Reservoir. The pier in Kennick Reservoir at its south end: constructed in the 1880's to supplement Tottiford Reservoir. This reservoir covers about 50 acres and holds about 200 million gallons of water. This reservoir is reserved for anglers. Source: J. Hayward (1991, reprinted 2009), Dartmoor 365, Curlew Publications, page 114. The notice in more detail. Weir and take-off point for water going to the treatment works, with the southern end pier of Trenchford in the background. Closer view of bushes under water. Zoomed view of the water works. A small building along the road when returning to the car park. This walk was accessed by leaving the A38 (Plymouth-Exeter) road at the Drum Bridges (Trago Mills) exit for Bovey Tracey, and driving north, passing Bovey Tracey on the A382. Turn right at Slade Cross and follow this single track lane past Mixing Barn Farm to a left turn. Take this turn and find the car park entrance (see the "Welcome to Trenchford Reservoir" notice) a little way ahead on the right, just past a small road on the right. Park at the yellow cross / P symbol on the map. Distance - 7.3 km / 4.5 miles.